What I like: Exploration, economics, and technology. Factions are varied with some interesting mechanics. Not So Much: Bland military and unit design spam. Other stuff you may like: Offers multiplayer and looks like it has modding support. The Verdict: Should please most 4X fans, especially space fans. Disclaimer: This review is based on a free review copy provided by Amplitude Studios. Welcome future emperors for we will embark on a journey of galactic conquest. 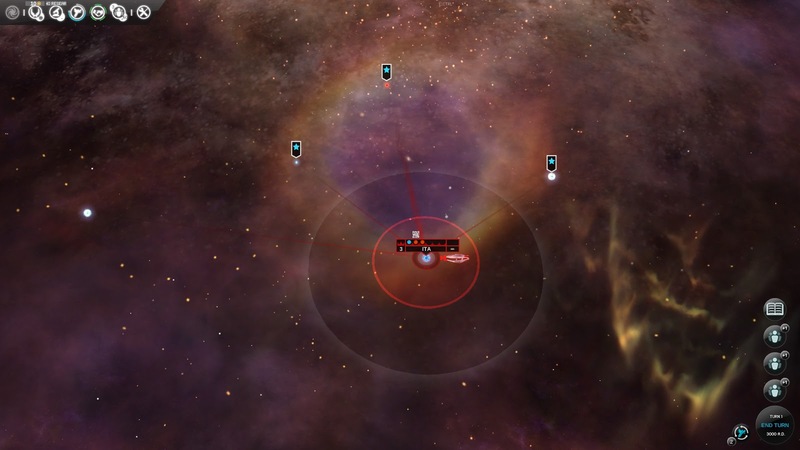 Endless Space (ES) is a fairly familiar implementation of a 4x turn-based space game. Anyone who has played a game such as Galactic Civilizations will be right at home. That’s not to say ES doesn't provide a few twists of its own. The game is set in Newark, New Jersey. I just wanted to see if you were paying attention. The game is in space! While the game is turn-based, ship movement is resolved simultaneously. While the game does offer multiplayer, this review only takes a look at solo play. I’m not the gaming socialite that some of you may be. Jumping into the game and playing is pretty easy as the game provides tutorial information when you encounter a screen for the first time. These are presented as annotated screen shots, and therefore aren’t directly interactive, but the information is provided piecemeal when you need it. The manual provides pretty much the same information as the tutorial, but does have some extra detail. Unfortunately neither covers some of the finer details of the mechanics, such as the full details of combat resolution. Like most 4x games much of the replayability is provided by the generation of randomly generated maps. ES provides many settings to customize the experience – shape, size, resource frequency, etc… I didn't find the number of options lacking. The default setting for resources is far too generous, which makes it easy to get most or all of the resources you need without trading. Many settings only have a low, medium and high value so it may be difficult to find a setting exactly to your liking. Some settings, such as resource frequency, may be better implemented in a way that allows finer tuning. There are 9 stock factions to choose from, along with the ability to create your own. Most of the differences are just bonuses and penalties on different aspects of the game and immediate access to certain technologies, but some are more interesting. The Hisshi have perks based on winning battles and losing systems. The Amoeba start off with the entire map revealed. The Cravers exploit the systems they inhabit gaining short term production benefits at the cost of long term sustainability. They also don’t play nice with others and can never be at peace. Multiple traits can be assigned to custom factions, each costing a point value and the faction must stay within the budget. It is interesting to note that the stock factions can exceed the budget while custom ones can’t. I can see it being better in a single player match to allow players to create overpowered factions either for their own use or to construct homemade challenges. This view should look familiar, a civilization ready to move beyond the confines of one lone planet, ready to explore the unknown vastness of space. Except this isn't a planet, but a solar system. What you see on the main map is the sun which represents a system with up to 6 planets (I guess we will have to get rid of Neptune and Uranus too). Starting small and growing my empire is what I like best about 4X games. Keeping track of territory is easier when it is expanded slowly. For me, exploration and developing the economy are the most important parts of a 4X game and ES succeeds for the most part. You already saw the suns on the main map. They aren't purely cosmetic. Their color provides a clue as to whether they host habitable planets. Planets also come in different varieties and generate varying amounts of the 4 resources that make up Endless Space’s economy – food for population growth, industry for building things, dust (currency) for paying for stuff, and science so your civilization can advance beyond simple space travel. As your population grows on a planet, it produces more of the resources its planet type can generate. Planets are also differentiated by having anomalies, moons and resources. Anomalies can provide perks or penalties. Planets with moons get some economic perks if appropriate improvements are built and also have the chance of having a powerful temple built by the Endless. Luxury resources provide economic benefits and make that planet more content, while strategic resources are needed to build some ship components and planet improvements. If you manage to grab enough of a resource it provides a pretty potent bonus to your empire. There is enough variety with each system between the planets, anomalies and resources to make exploration interesting. All of these facets work together to give each planet a little more differentiation so each jungle planet doesn't feel like every other jungle planet. Balancing this mix of resources is the challenge for running a strong economy. It isn't always best to colonize the first system you see if it doesn’t have the right mix of planets. Since we are in the space age here it seems like it should be possible to shuttle food from one system to another, but we can’t. That would also open up some interesting strategic possibilities for cutting off an enemy’s food supply. Economic micromanagement is pretty low as the player’s main decisions are where to colonize, what to research, and what improvements to build. 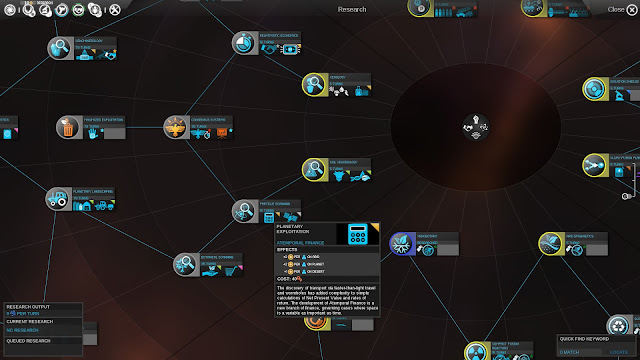 As your system’s population grows the new inhabitants are automatically assigned to one of the colonized planets, although you can take control and adjust the distribution. I never felt the need to. Trade routes are automatically generated with other factions that have peaceful relations with you civilization. Peeling back the darkness from an unexplored map to reveal prime real estate is one of the exciting aspects of a 4X game. One of the things I like about ES is the way it handles space travel. To start with, ships can only travel along predefined space lanes between planets. After making technological progress, wormholes can be used to access areas of the galaxy that were previously unreachable. With the right tech, wormholes become linked and ships can enter one and pop out of an unrelated one, making for faster travel across vast distances. The last stage is freedom of movement without the space lanes. It is usually faster to stick to the lanes, but freedom of movement lets players bypass planets guarded by their enemy. One aspect I don’t like about this is that ships can only engage other ships at systems and can’t intercept an enemy on route. On some level I suppose it makes sense if they are in the middle of some type of warp travel, but it does lead to some gameplay frustrations. Better tech can increase your ships speed so you can get to those far systems faster, claiming a system before a rival or defending a system under attack. Initially, only a limited amount of planets can be colonized. With the right techs your choices open up. Later in the game planets can be terraformed to other types. Since planet output is affected by system improvements it would be nice if the game showed the effects of terraforming before doing it. The biggest hurdle to expanding is managing your peoples’ happiness. Claim too many systems quickly and discontentment grows, stifling the economy. Let a system get too populated and overpopulated becomes a factor. Like most problems you’ll face, researching the right techs and building system improvements elevates some of the pressure. 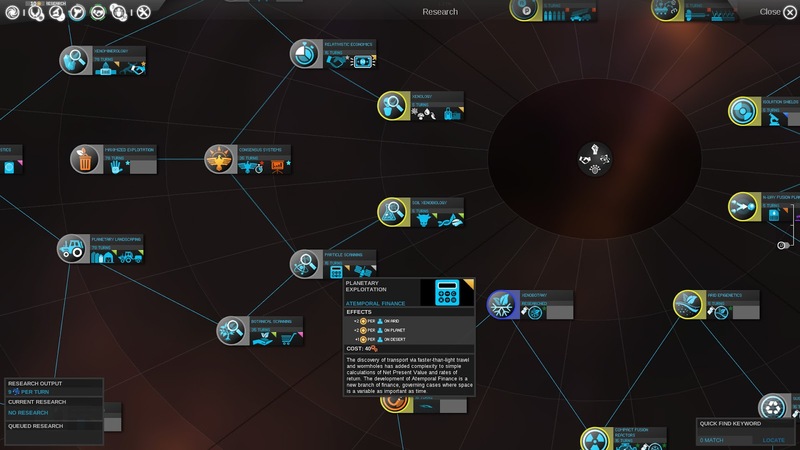 There are 4 main areas – Galactic Warfare, Applied Sciences, Exploration and Expansion, and Diplomacy and Trading. Each branch can be researched independently allowing the player to focus on the area of their choosing. There are several branches within each main section too, so some areas can be bypassed to get to more desirable ones. I found myself choosing different paths based on my situation from game to game even if there were some techs that were my favorites. I was pretty pleased with the amount of choice the player is given regarding the tech tree. It feels like there is much more freedom than Civilization. 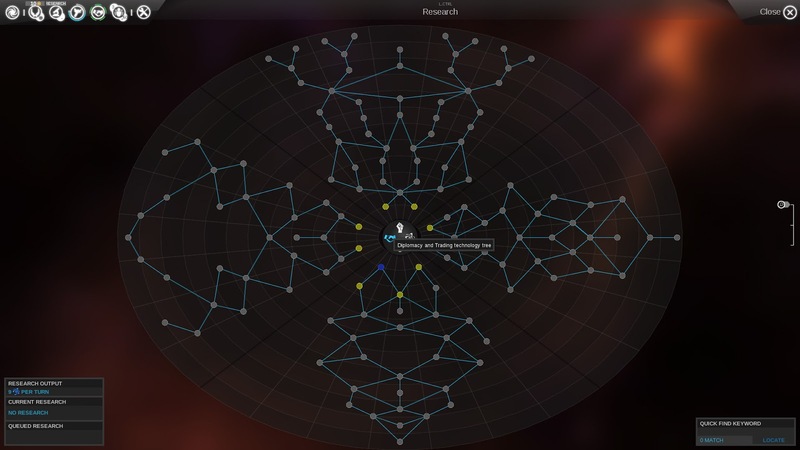 The tech tree can be zoomed out, showing the big picture or zoomed in to see the details of individual technologies. There are some faction specific techs to go along with the tendencies of that faction. I have an inclination to go for techs that lead to scientific and economic improvement, leaving my military as weak as possible. This can backfire if an exploration event unleashes some pirates or an aggressive faction becomes my neighbor. Eventually another race will meet your acquaintance and provide a new set of challenges. Another one of my favorite aspects of ES is how different relations are handled. When another faction is first encountered, their status with you is cold war. They can be engaged in battle outside of both factions’ areas of influence without declaring war. Eventually a state of peace can be brokered allowing a trade agreement of sorts and an alliance. When the state of the relationship changes, time must pass before it can be changed. This helps prevent the system from being gamed. Fortunately each races’ attitude with you can be explored via a tooltip. Close borders can cause tensions to rise, a weak military may put a target on your back, but many peaceful years of relations can cause friendship to endure. Sometimes I felt it was a little too easy to maintain peace, but factions behaved in a rational manner. Diplomatic actions are fairly basic – peace, trade, alliances and wars and while different combinations of items can be part of a trade agreement the underlying system doesn't add any new options to the 4X formula. Eventually there will be military conflict. While the system is serviceable, for me it was the weakest part of the game. Ship design is pretty straight forward. Pick a hull and add weapon, defense and various support modules to it. Some hulls are better suited for a particular class of modules. This works out well, but once the more advanced hulls were researched I never felt the need to include the other hull types in my arsenal. Where to station your fleets is perhaps the most interesting military decision to make. They can guard systems, preventing enemies from moving though them without a fight. ES uses a similar model that Galactic Civilization uses – 3 weapon and 3 defense types. While in GalCiv each defense type was geared towards one weapon type all defense types provided some protection. ES takes it further – flak only defends missiles, shields defend against beams, and deflectors defend against kinetic weapons. This leads to the following scenario. Enemy A doesn't have much flak, so you equip more missiles on your ships. Then the enemy adapts and puts on a lot of flak, so you switch to beams, he adapts again, and so it goes. You can also chose to build more balanced ships. I think the system could be improved by adding some type of cost to adding new ship designs. Perhaps a design doesn't become available for X number of turns, or has a science cost. Perhaps the initial units of a new design take longer to build. Anything that can prevent new design spam would be good. The relationship between a missile’s evasion and the flak’s accuracy isn’t explained at all. A more detailed post combat log showing which ship attacked whom, with each attack’s results round by round would be welcome so ship performance could be better evaluated. The twist that ES adds to combat is the card system. Cards represent combat strategies – increase shield power at the cost of deflectors. There are quite a number of different cards to use. Many are unlocked right from the start and others are unlocked via techs. It would be more interesting if factions had to build up their skill with each tactic before it became fully useful. Do you become a jack of all trades or specialized in beams? Perhaps experience with different weapons and defenses should unlock the cards. Each class of cards counters another class, negating the effect. Selecting a card boils down to comparing the weapon and defense load out of each fleet and choosing the card you think should work best, trying to avoid getting countered by making an educated guess about what the AI will choose. As it stands now the system feels rather bland. Other than card selection for each of the 3 phases of combat it is a hands off affair. I don’t mind the hands off nature for a strategic 4X game, but the system can be improved. Random heroes come knocking at your door, giving the faction the opportunity to hire them. They specialize in economic or military improvements and gain experience over time allowing them to earn perks. Heroes are pretty powerful, but felt bland like the combat system. I had my favorite upgrade paths I selected each game so the process was rather automatic. I’ve been playing on normal sized maps, and the end game has always been manageable. 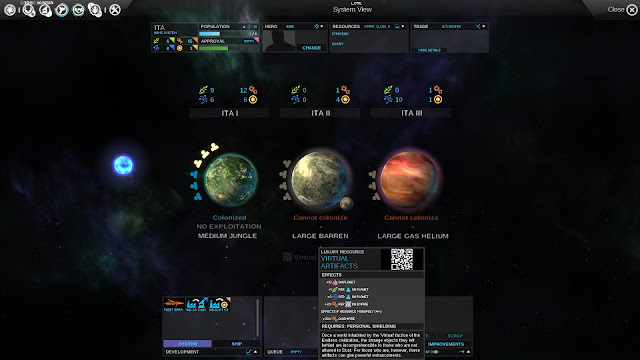 An Empire Management screen exists, allowing players to look at all of their colonies at once and even manage them. 7 victory types exist allowing many different play styles to succeed. I’m not sure they are all balanced. The wonder victory seemed much too easy, while the diplomacy victory a little too hard. I did come close to a diplomatic victory in one game. Luckily each victory type can be toggled off if it isn't to your liking. For the most part the UI is clean and presents information clearly. Tooltips are common and hovering over an item is usually a good idea to get some insight. There are a couple tooltips where the information just doesn't make sense until you search the forums – I’m looking at you nominal output tooltips on the planet screen. Each turn alert icons pop up on the side of the screen to remind the player about items that need addressing, but the message for it doesn’t have a ‘goto’ button to take you to the event. It is well and good to tell me that system Zoltar is being invaded, but give me a button to jump to it please. I have played all of my 75 hours or so at the normal difficulty level. I won my 2nd game and probably won a few more than I lost. I’m pretty sure I could bump up the level and still win the majority of games. Once you get comfortable managing your economy and expansion the game gets easier. Even at the normal level the AI gets some modest bonuses. That being said I haven’t noticed anything particularly bone-headed by the AI (I don’t try too hard to find AI problems, but it seems ok). While I typically get a jump on it in the early game, it tends to make up a little ground once my expansion bogs down. During war the AI has bypassed my stronger defenses to grab easier targets. Endless Space is certainly a pleasant looking game with colorful effects adding beauty to the galaxy. None of the ambiance artwork is distracting or gets in the way of play. The music is a calming spacey track that fits right in. The battles themselves can be watched but I find that a waste of time. The game performed very well without any crashes. The map occasionally has displayed planets in the wrong location after I scroll, but corrects itself. I’m not typically a big space game fan, but do enjoy 4X games. Endless Space surprised me and I liked it more than I expected. Systems have enough variety to make exploration interesting. By default resources are too plentiful so the need to trade for them is limited. Galactic-wide random events and exploration events are too plentiful also. I’ll have to try decreasing resource availability and exploration events. The random event can only be turned off. Most of the factions have a distinct feel and some have truly interesting mechanics. The ability to create your own is welcome, even if they are weaker compared to the standard ones. The different methods of travel are interesting facets of the game. Managing the economy has enough to do to be interesting without overwhelming the end game. The large tech tree allows the player to truly choose their own path. The diplomatic model is solid but doesn't really add anything new other than the state of cold war. Finally, the military and hero aspects were fairly bland and the ship design spam to constantly adapt to the enemies was a little tedious. Endless Space plays out in a typical by the numbers fashion, as do many 4X games. While it isn't my favorite 4X game, it is a worthy addition to the genre and I can recommend it to any 4X fan, even if Darth Rubin at Space Game Junkie says it has no soul. ES may have given me the courage to try reviewing Distant Worlds. Amplitude Studios is continuing to improve the game and it will be interesting to see what improvements they can make. A solid effort. Darth Rubin, huh? I see how it is. Oh, you'll have your day Rob. You'll. Have. Your. Day. Are you going to build a Death Star and blow up my planet? I presume you live on Earth too so that won't work. I will be weak and curled up in a corner when I take on Distant Worlds, so I may succumb to your dark use of The Force. It isn't that I think Distant Worlds will be a bad game or poorly made, I wouldn't bother wanting to review it in that case. It, just makes me nervous for some reason... (<-- matching your use of ellipses to see if that will make me better at Distant Worlds).
" Anyone who has played a game such as Galactic Civilizations will be right at home." That, to me, is pretty horrible, as i hated every little bit about GalCiv games. Of course, as i already played the game, i know that it is substantially better design than that Stardock piece of trash. Even if both games indeed have a very tiny amount of soul in them. Hey, that's OK if you didn't like Gal Civ. What I said is still true, if you've played Gal Civ jumping into Endless Space is pretty easy since a lot of the mechanics and concepts are similar. Currently on sale on steam for $10. I'll be buying it based on your review. Thanks mate.